Free 3D Ultrasounds for the Miami & entire South Florida Community! FNUCareersFree 3D Ultrasounds for Miami, South Florida Community! Free 3D Ultrasounds for Miami, South Florida Community! Florida National University (FNU) is not only dedicated to helping our students succeed, but we also have the compassion to help our community in the South Florida area as well. One of the ways we try to help our community is by giving the public the opportunity to take advantage of FNU’s state of the art medical equipment used to teach our students how to become exceptional healthcare professionals. Offering free ultrasounds serves as a great opportunity for the South Florida community to receive a free medical service that might otherwise cost them hundreds, possibly thousands of dollars. It also gives FNU Sonographer students experience, providing them with the opportunity to apply the practical concepts of this profession into real-life scenarios. First, it’s important to fully understand the role and duties of a Diagnostic Medical Sonographer Technician. What is a Medical Sonographer Technician? A Medical Sonographer Technician is a professional who is qualified to provide diagnostic patient care services using the ultrasound equipment and other related diagnostic procedures. Such a position like this requires an ample amount of education that teaches students how to accurately practice such clinical procedures and processes that are only permitted by law. 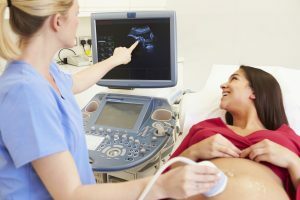 Before any of our Sonographer students are permitted to give free ultrasounds to the general public, he or she must first demonstrate a high standard of competency that is approved by the Division Head of the Diagnostic Medical Sonographer Technology degree program and monitored by the FNU clinical coordinators and professors. All FNU Sonographer students work toward earning an associates degree as a Diagnostic Medical Sonographer. This degree takes 26 months to earn for a full-time student. The total number of credit hours needed to complete the program is 87. While this program is not currently offered online, it is possible to enroll on a part-time basis. 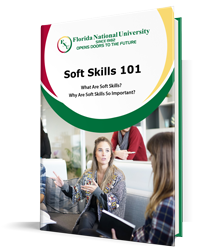 However, students need to be aware that there are a few core courses that follow a specific sequence. As a result, full time enrollment is necessary for such classes. If you’re interested in becoming an FNU Medical Sonographer Technician student, consult with one of our advisors for assistance in scheduling the classes that will best fit your academic goals. In order to obtain free ultrasound services from FNU’s Medical Sonographer Technology program, one must volunteer and sign a disclosure form that clearly states that the volunteer understands that this is a free service and that healthcare students who have been thoroughly trained to operate such equipment will be conducting the procedure. It is also understood that these ultrasounds are not diagnostic services. However, volunteers can keep a digital image if they bring their own USB device. With the state-of-the-art scanning equipment that FNU has, volunteers have the opportunity get a developing fetus scanned if the volunteer is pregnant. Volunteers can also have other parts of their body scanned like the liver, gallbladder, kidneys, thyroid and other organs. For pregnant volunteers who are interested in getting an ultrasound of their baby, FNU has the capabilities to provide 3D or 4D images. Volunteers can take confidence in knowing that they are in good hands with FNU’s Sonographer Technician students. Our students are fully knowledgeable in a variety of subjects such as Abdominal Sonography, Obstetrics and Gynecology, Small Parts, Vascular Technology, Echocardiography, Neonatal Applications, giving them a competitive edge in the job market. The entire staff of FNU, and in this particular case—within the Diagnostic Medical Sonography program, is committed to students success, not only while our students are attending, but beyond. The overall mission is to provide students with a higher quality of education by qualified professionals in the field. Graduates of this program can expect to walk away equipped with enough knowledge and skills to make them applicable as an entry-level sonographer working in a variety of healthcare environments like hospitals, private practices, outpatient centers, diagnostic centers, and more. With the associate of science degree as a Diagnostic Medical Sonographer from FNU, students will be eligible to take their registry or specialty examination, solidifying their expertise in the field. Once students have graduated and completed the required procedures, they are able to take the American Registry of Radiologic Technologists (ARRT) examination for ultrasound. Once they complete that registry, then they’ll be able to take the American Registry for Diagnostic Medical Sonography (ARDMS) specialty registries. Furthermore, FNU students will also able to take the Sonography Principles & Instrumentation (SPI) examination from the ARDMS once they have completed their Physics and ultrasound courses and pass the with a letter grade of “C”. Once a student is registered, he or she must maintain 32 continuing education credits on a biannual basis to keep the registry active. Graduates can do this by enrolling in online classes, or by participating in local society meetings and/or annual conferences. FNU’s Medical Diagnostic Technology students are more than able to conduct a professional ultrasound. Volunteers in the community are in the most capable hands thanks to the administrator and faculty members of this degree program. If you are interested in volunteering for a free ultrasound, simply call any of our FNU campuses to request an appointment. Provide our receptionist with the type of ultrasound that you’re volunteering for, and don’t forget to bring your USB device so that you can keep a copy of your image. It’s that simple! If you’re interested in enrolling in our Diagnostic Medical Sonographer Technology associate’s program, then contact an FNU advisor to discuss financial aid options to begin the admissions process today!